Sit by the waterfall and soak up those soothing splashes. With special 3D sounds! There’s something incredibly relaxing about being by a waterfall. Now with the aid of this CD you can re-create this experience any time you like – even if you live in the middle of a desert! Pop this CD on your computer or music player and you’ll imagine yourself beside a beautiful waterfall in the middle of the tropical rainforest. The water cascades into a clear blue lagoon, sending clouds of shimmering droplets into the air. The gentlest of breezes fans your face, and you can almost feel a few of those droplets cooling you. Above the sound of the water, you hear other sounds of the forest – birdsong, insect noises, the occasional leaf falling from high in the tree canopy – all accompanied by soft, ambient background music. And as you listen, you’ll feel all the tensions flowing from your body, leaving you perfectly relaxed. 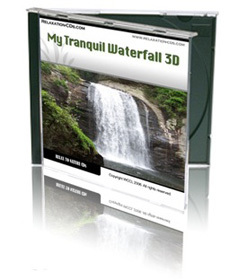 You’ll be ready for whatever adventures life has in store for you next – knowing that with the aid of this CD you can return to your perfect waterfall any time your spirit needs to be revitalized.